Johnny Janot enjoyed success as a radio deejay in Eunice, LA and Beaumont, TX. He hosted the very popular Cajun Bandstand radio show on KLVI during the 1970’s. He also recorded songs in the country, rockabilly and Cajun genres, many of which are included on this Swallow compilation. 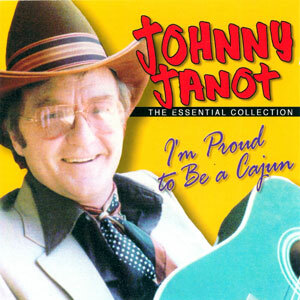 Though Johnny Janot enjoyed success as arecording artist and songwriter in his earlieryears with his country and rock-a-billy songs, it was his Cajun music recordings in his lateryears proved to be more successful.Johnny’s music is some of the mostrequested and memorable Cajunmusic to date.On that note,SwallowRecords has assembled,arguably,the”essential collection” of Johnny’s best andmost memorable Cajun music recordings. Johnny was also a top ambassador for the Cajun heritage, a way of life builtaround deep feelings.As he would say,”It’s the good times and thehard times.It’s good friends and simply letting the good times roll.”He had a way of making you feel proud that you were a Cajun andwishing you were even if you weren’t. Mr. Janot passed away in 1984.